Needless to say, most of our online business comes from Google’s organic search results (SEO). With the ubiquity of online browsing on mobile devices, Google now wants to achieve a consistent standard to apply to web pages when delivering content to any mobile device and tablet, ensuring that pages load elegantly and instantaneously. How did they achieve it? Accelerated Mobile Pages (AMP) is an open-source framework launched by Google in February 2016. This framework changes how Google evaluates our SEO rankings by placing a higher priority on mobile performance. While there has been a huge focus on adapting websites for the limitations on mobile (high data costs, slow loading times, and poor content rendering), mobile browsers have, until AMP, lacked the benefits of a dedicated framework. With their determination to further improve loading speeds, Google uses server-side rendering of AMP elements to cache page contents on Google servers. This will allow the content in pages to reach the browser as quickly as possible. This strategy appears to be coming into fashion, as there are currently over two billion AMP pages online, on over 900,0000 domains internationally. If you think that AMP only focuses solely on smaller devices, you are wrong. AMP will load in any modern desktop browser as the project’s own website is coded solely in AMP. This is a leap forward for mobile optimisation and theme responsiveness, as there is now a provision for mobile experiences that uses a discrete code, removing content that is redundant on small screens. Since we’ve established that websites that implement AMP have an SEO advantage on Google’s organic SEO, you might be wondering— how else can your eCommerce store benefit from AMP? The biggest advantage that AMP shares with both media channels and eCommerce is speed, since faster loading sites will simply gain better opportunities to generate sales. In this context, you could dramatically lower your online store’s loading speed for mobile by adopting a streamlined framework, your competitors could be reaping huge rewards over your clients. Imagine if your online store is making $100,000 per day: a one second page delay could potentially cost you $2.5m in lost sales every year (Kissmetrics). Moreover, it is also possible to create AMP versions of Shopify pages through the API. Some of the apps in the Shopify App Store have also successfully leveraged this technology to provide a conversion service for clients. Henceforth, it is likely that AMP will see growth worldwide, given that Google has announced during a recent developer conference (AMP Conf) , that AMP will be applied over the search engines of Baidu, Sogou, and Yahoo Japan. The open-source framework continues to build its impetus, and more plans for improvements are on the way, including third-party log-in and support for eCommerce analytics. If you are worried about lacking behind the competition, or would like to know more about this issue, Web Design Market can certainly help with your digital marketing strategies; we have proven results from a large variety of clients. Contact us today for a free quote! With the crazy amount of information online competing for users’ attention, Wordpress SEO plugins such as Yoast allow you to take actionable steps to ensure that your quality content gets to be seen by the right audience, leading to higher conversions. 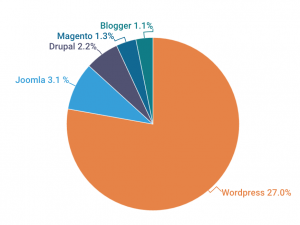 A staggering 27% of all websites on the Internet use WordPress. Being easily customisable, it’s definitely a worthwhile CMS to use for small-to-medium businesses looking to level the playing field by establishing an online presence. As WordPress and SEO experts, we’ve found that one thing that’s often overlooked by content creators is the optimization of images, whether for your blog or your landing pages. This can help with Google rankings and backlinks. Users can be redirected to your site via Google Images, and Google reads your page to be of high quality. 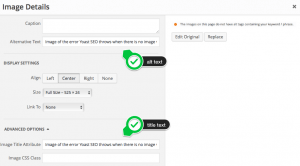 So we’ve made it easy for you — we’ve broken down four simple considerations for how you can prep your images to make the best use of Wordpress SEO (though this is applicable to other types of CMS). 1. Find the right image. This should be obvious, but placing an image into your blog or landing page should not be for purely SEO purposes. Whether you’re using your own images or stock photos, they still need to fit in with your overall branding and message. 2. Do your keyword research. The file name of the image you’re uploading. The alt and title text: The title text appears when you hover over the image, while the alt text is used when the image doesn’t load, or on browsers made for the blind or visually impaired to describe the image. Captions, if you decide to include them. When naming or describing images, remember to use hyphens instead of underscores, as Google would read, for example, ‘file_name’ as ‘filename’, and ‘file-name’ as ‘file name’ — this can affect your SEO. 3. Consider the whole of your content. Now that you’ve got some eyes on your page, make sure that they don’t take a glimpse of what you have and decide not to stay! Bounce rate matters to your Google rankings. Preview your drafted posts and try to evaluate them from the viewpoint from one of your readers. Are the images in your header? In a slide? Between text? Consider, for example, the alignment of your image and where you’re embedding your image within the text. Does it fit, or is it interrupting the flow of the page? 4. Adjust your image file size. Your file size is also taken into account by Google, as it affects your website speed. This then affects the quality rating of your website. Most basic image editing tools have the function to adjust your file size, for example Canva. Pair these four tips with your existing WordPress SEO and content strategy. Images can play a role in generating leads, too!